Transform the appearance of your hair with Milk + Blush ombre seamless hair extensions. Instantly get longer ombre hair which you can seamlessly clips in to your own hair. Deluxe seamless clip in hair extensions are discreet and virtually undetectable when worn. Made with a flat silicone base strip, they’re so blendable that you may not even notice you have them clipped in. A classic volumiser weft is included in the set too, so you can get the very best of both worlds. 2 Full head set, perfect for length and thickness. 3 Made with beautiful 100% Remy human hair. 4 Total of 10 wefts (1x8", 2x6", 5x4", 2x1.5"). The beauty with Milk + Blush hair extensions is the multi-tone shade adapt that happens when you clip-in your new hair. Multi-tones enable a match even if your shade is slightly different. Choose the closest match and your extensions will blend and adapt to your own hair. For help choosing a shade of hair extensions, you can send an email with pictures of your hair. All our Hair Extensions are made with 100% remy human hair. It takes years to grow the hair used in hair extensions, we kindly ask you to take extra care with your hair extensions compared to how you would treat your own growing hair. Hair extensions do not have the natural supply of oils and nutrients which your own growing hair has. Therefore, extensions do not need to be washed as often. Hair extnesions can be cleansed once every six weeks or when they have a significant build up of products. To cleanse the hair please carefully follow the following instructions. Mix half a cup of warm water with a tablespoon of shampoo. Choose a moisturising shampoo (Do not use shampoo for volume or for dyed hair). Fill a stain resistant sink or bowl with warm water. Mix the cup of diluted shampoo into the water. Whilst dry, brush the hair extensions, starting from the ends and working your way to the roots. Gently place the hair extensions into the water and very gently massage. Do not swish or swirl the hair. Remove the extensions from the shampoo mixture. Rinse the hair under a running tap, holding the extensions at the top of the weft. Do not swish the hair around, instead let the water run through the hair to rinse away the shampoo mixture. Gently squeeze out excess water and lay the extensions flat onto a towel. Apply a conditioning treatment to the hair extensions- a good quality repair treatment will be best. Fold the towel over the hair, leave the treatment to soak in for a short while and then rinse the product out. Apply more of the repair conditioner treatment or a leave in conditioner to the extensions. You can use a bit more than what you would use on your own hair because it is harder for extensions to get greasy. Fold them into a clean towel and leave overnight to dry naturally. You may wish to store them in a safe place in an airing cupboard to help speed things up a little. Once your extensions have dried naturally, you can comb through them, starting at the ends of the hair, the mid-lengths and then from the roots to the ends. Lastly, apply a heat protection product and straighten out one weft at a time. Finish off by smoothing a light smoothing product over the extensions. You can use heat tools such as straighteners, curlers and crimpers on hair extensions but just like our own hair, the less heat applied the better. Make sure to always use a good quality heat protection product which can be applied to the extensions before you use any heat tools. Do not hold heat tools on the extensions for long periods of time because hair extensions often curl and straighten far more quickly than our own hair. You may find it easier to style your extensions before fitting them into your hair. Hairspray is ok to use on the extensions but choose a high quality hairspray which can easily be brushed out and use sparingly as it does dry out. We do not recommend using sticky or greasy styling products on the extensions, styling with a light silky texture will be your best option. The extensions can only be dyed two shades darker. As the extensions have already been through a chemical process, they can’t be lightened or bleached. Additional lighting or bleaching is likely to affect the condition of the hair. The only extensions which can be dyed more than two shades darker are the ‘Dye It Yourself’ extensions. However as they are a neutral shade, they will need to be pre-pigmented prior to adding your dye. It is always easier to choose an extension shade which is already close to the target shade of dye you intend to use. You will need to use more dye than usual. Two boxes of dye per whole head of extensions is usually enough. You must completely saturate the extensions in dye to prevent an uneven result. We recommend applying dye to each strip of hair one at a time. As we do not accept returns on dyed hair extensions, you should ALWAYS perform a strand test first! This means dyeing just a few strands of the hair to check the result shade is correct. If you are happy with the result then you can dye the whole set of extensions. To apply the dye, use the flat palms of your gloved hands and pat the dye through the hair in a stroking motion from root to tip. Do not rub or tangle the hair. The maximum peroxide which can be used is 20vol (6%). Semi-permanent, permanent, quasi-permanent, toner and vibrant dyes can be used. The hair can be dyed more than once but remember, just as your own hair will become damaged from certain dyes, your hair extensions will too. Always follow the dye manufacturers instructions. Wear protective gloves and thoroughly rinse the dye from the extensions. Also, make sure that you follow the Hair care guidelines when washing and drying your extensions. Use a hair bobble and hair net to keep your hair extensions together and then pop them back into the bag or box which they arrived in. 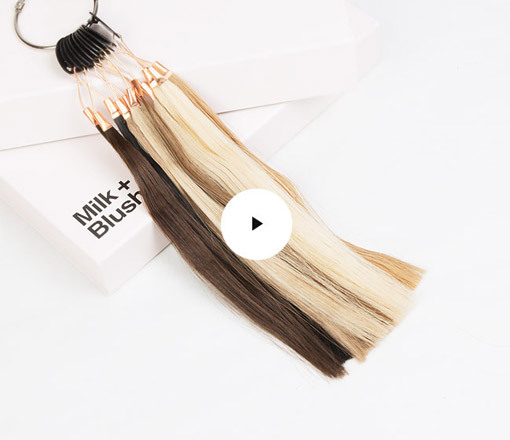 Watch our video to see before and after hairstyles using Milk + Blush hair extensions.